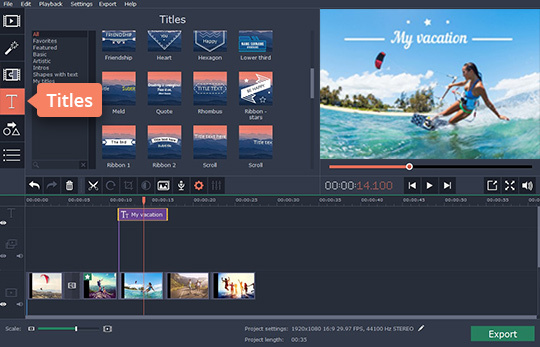 Create your own movie and share it with your friends – they’ll be impressed! First, open the files you want to work with. 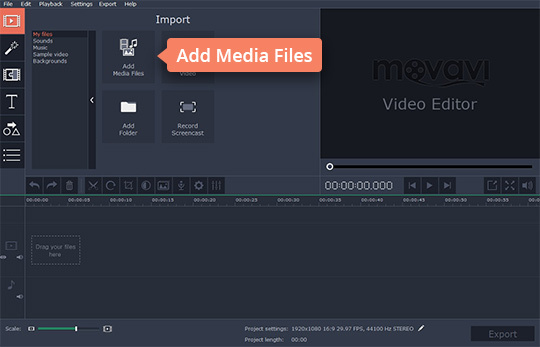 To do this, click the Add Media Files button, locate the desired photo, video, and audio files on your PC, and click Open. The files you’ve uploaded will be automatically added on the Timeline at the bottom of the program window. To start editing a video fragment, select it on the Timeline. Then set the red marker to the position where you want to cut the clip. After that click the Scissors icon to split the video into two parts. To remove an unwanted segment, select it and click the Wastebin icon or just press Delete on the keyboard. 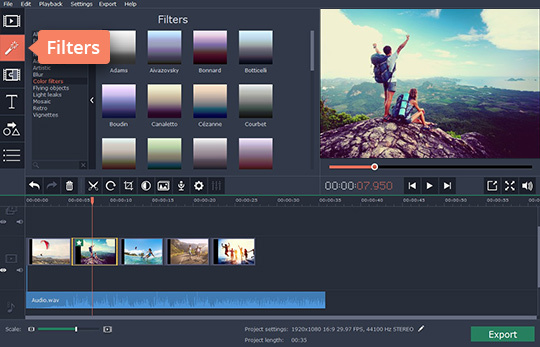 Click the Filters button and you’ll be taken to the Effects Gallery, with more than 160 professional video effects and filters. Click the icon for the effect you’d like to try, and you’ll see a preview of how it will look when applied to your video clip or picture. To apply the effect to the clip drag it onto the target fragment on the Timeline. Click the Transitions button to see the list of available transitions. To preview the fades, click the icons for the transitions you’re interested in. 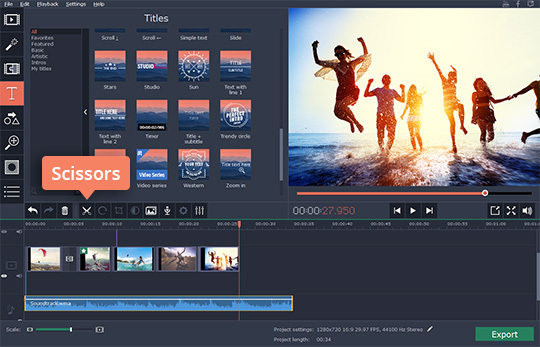 Choose the transition you want, drag it to the Timeline and place it between the two clips or photos you want to link. Click the Titles button, and you’ll see a list of ready-made title styles. 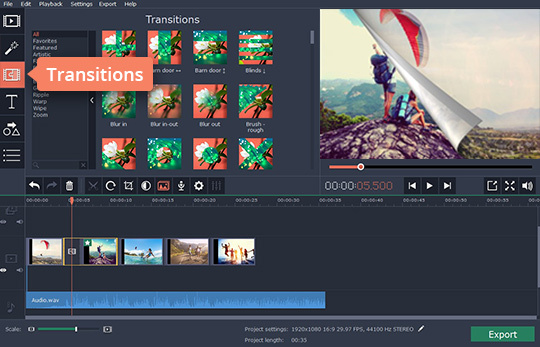 As with the effects and transitions collections, each title style has its own demo. Just drag the desired title on the Timeline and it will appear on a separate Titles track. Double-click on the title to type your text and set the desired parameters for it. The music is longer than the video. Click the audio file on the Timeline, drag the red cursor to the end of the video track and click to cut out the excess part of the audio. 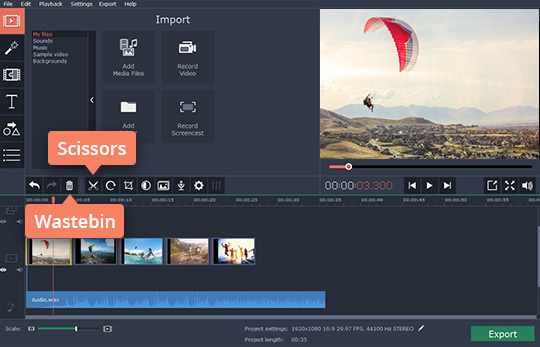 Delete the unwanted audio fragment in the same way as you did with video clips. The video is longer than the audio. “Loop” the music playback: add several copies of your audio file to the audio track by dragging it to the Timeline as many times as needed, then cut the excess audio at the end. Don’t forget to save the movie project you’re working on. 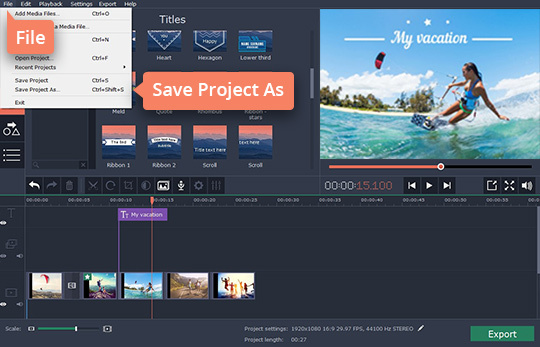 You may need the project later if you want to change something in your video or just save it in another format. Choose Save Project As from the File menu. Specify the folder where you want to save the project file and enter the file name, then click Save. Now your movie is ready for viewing. All you need to do is to save it in the most appropriate format. Click the Export button and choose the desired export option. To save video for watching on your PC or mobile device, choose the appropriate format or preset in the new window and click Start. 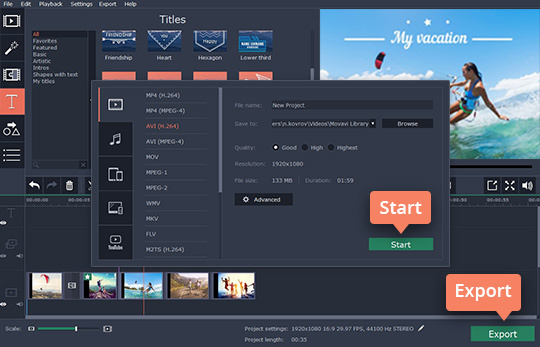 After the conversion is complete, the folder containing the finished video will open automatically. Now you can watch your video on any media player. 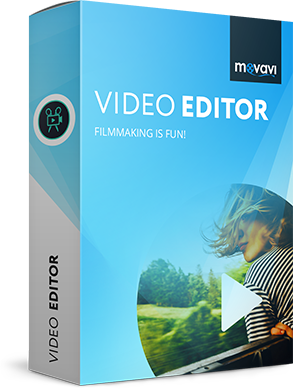 Haven’t tried Movavi Video Editor yet? Download the 7-day trial version! Liked the program? Purchase the full version now! Buy the full version and use the program without limitation!